Q. What do you call a man with a metal pyramid on his head? 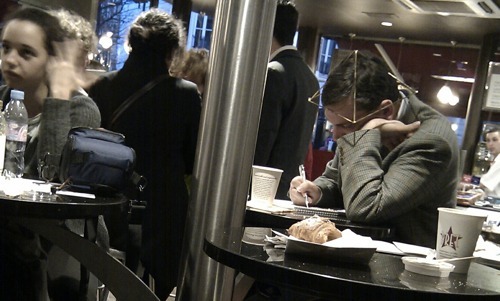 I spotted him yesterday in the Leicester Square Pret A Manger, sketching in a notebook. When I got home I searched the internet for mentions of the man sporting this idiosyncratic headgear. It turns out he’s something of a quiet phenomenon, and has been spotted wearing a pyramid since at least 2006. Sightings have been recorded on Ni.cho.las’s blog (July 2006), Yahoo Answers (2007), The Answer Bank (Feb 2009), a Ning blog (Nov 2010) and plenty more in the comments on those pages – not to mention various appearances on Flickr. But in fact it is Hayley’s report from 2008 that has proven most enlightening. Her post has attracted plenty more sightings in the comments – eventually resulting in a response from the man himself. Brilliant! So what’s with the hat? The pyramid hat is apparently called a ‘Raydome’, “a 9-inch steel based headgear pyramid that is orgone plated, applying layers of 24 Karat gold and silver” according to the Pyradyne website that sells them. And Dominic says “it’s very good in terms of what it says it does”. It looks like the Raydome isn’t the only model of metal pyramid hat, though. The perfect hat for beginners is the Pyradome (pictured left), “specially recommended to those new to Pyramid Technology”, while the highest grade pyramid hat is the Powerdome, a pyramid hat made of PURE TITANIUM. But I digress. I should explain how I know Dominic’s name. It’s because it’s on his Twitter profile, of course! In the pre-internet age of ignorance (e.g. 1990), a local legend such as the Pyramid Hat Guy would spread mainly in rumour and would be terribly difficult to verify. These days it’s exciting but also a little disturbing to see one man’s life documented so casually and yet – if someone was to join the dots more than I have – so potentially intrusively. Thankfully, having seen Dominic (or Wmmvrrvrrmm)’s commentary in various places, I am pretty confident he won’t mind yet more coverage – it’s not as if he doesn’t know that his headgear makes him a talking point. So, although I don’t believe in the powers of the pyramid hat (or ‘pyramid power’ in general), I’m very glad that the tradition of the great British eccentric is being kept alive. So hats off (and back on again) to you Dominic, and your marvellous triangular headgear. I went to Amersham College with Domonic believe it or not. He was on my foundation course. A real loner. And very quirky. All he ever did was scribble in his note book and listened to Vanessa paradi on his walkman. I saw him on the Bakerloo line just yesterday afternoon (11th Aug)….and I Knew instantly that this was is was Domonic. This is so Strange…I last saw him in 1994. Can’t believe it….I thought I’d never see this guy again. 2018 and he is on he bakerloo line. Still adorned by the triangle that fuels our interest. I saw him there yesterday and googled it! Hi Sara-Jane! Good spot. You can always upload it to a photo-sharing site like Flickr, Picasa, Twitpic etc. I see him often on my way home at 6.05 pm, Dominic is usually leaving the pret a manger where everyone else has been meeting him!! My work colleague saw this guy in Forbidden Planet last week. I sent him your blog post, David, and I can now confirm that “you have made his week”. I was in Forbidden Planet yesterday and saw him! Did a bit of a search and found this page, good to know I’m not the only one who has seen him! I’ve seen him a few times too – once in Forbidden Planet, and a couple of times at Northwood Hills Tube. awesome… that must be the perfect place for him… love forbidden planet. Theres a man here in danbury ct in the us who has been sporting a metal one like that for at least 10 years now.I have never seen him without it. Oh man. I know this is a long shot. But I just remembered seeing a man [I think the guy in Danbury] with one of these on. Do you know if this guy is still around? I saw him in Harrow last week, at the train station. He was spotted there a couple of years ago too, and might actually be based in the area going from an old blog post I found. I just saw this man on a Chiltern Line train to Harrow-on-the-Hill. He had company (another man without a pyramid hat) and seemed to be relatively normal apart from the wacky headgear. I saw him today! He was at baker street tube station and going to marylebone station to get on the chiltern line. He was wearing the exact same jacket and, of course his pyramid! It definatly looked very strange but not many people seemed to be staring at it. This is fascinating. I have only just resorted to google after seeing this guy around London off and on for years. I was prompted to do so by seeing him in Leicester Square yesterday. I have also seen him at Baker Street tube occasionally. I wonder if he actually works for a living, and if so, as what. He works in desktop publishing and is a very good draughtsman. You should look at his sketch book. The word neurodiversity comes to mind! I just saw him in foyles bookshop and googled man with a metal triangle on his head and found this page. Awesome! I saw him in Foyles bookstore near Tottenham Court Road too! It was a couple or so weeks ago, I asked him in a polite way why he wears that thing and he told me the same things, like it clears his brain of toxins, keeps him focused, etc. His voice was a bit monotone, robotic in a way. He then said “thank you for talking to me” and I said “thanks” and he walked away. He seemed a little odd, but otherwise he just seemed like a normal guy browsing through a bookstore. I’ve seen him or someone with the same headgear thing quite a few times around this city, so that’s why I had to ask, I’m a curious person. He’s awesome. We saw him on Saturday night just gone in Pret in Leicester Square and about 4 months ago in Oxford Street Pret. I hope to make it a hatrick soon…. We saw him yesterday, 14th Jan on the London underground!!! Just seen Dominic on Piccadilly circus! Sat reading a science fiction book in Blackwell’s on Charing Cross Road as I type this. Very interesting man. Once you look past the shock of seeing a man with a pyramid on his head. I take the same bus home as him on most days. We get off at the same stop, he seems like a nice guy. Always thanks the driver and lets me off first. When I was younger I found the pyramid odd but it kind of suits him! Hello I am in Pret and Manger in Oxford St. and Rathbone Place and Dominic just saw your pyramid, first and amazed and I laughed at the same time, after I searched online and found this page. Now I understand. I expected everything I’ve been on holidays in London unless this man. Now I think my holidays are completed. I’m from Harrow and work in Pinner, just saw him walking up to Pinner station a few minutes ago. I’ve been on the same train home as him a few times over the years and when me and my friends have asked him about it he’s been perfectly alright. He’s a bit unnervingly calm about it but seems perfectly harmless, he must get asked about it every single day. I love the fact that this guy is still a bit of a mystery. “He’s a bit unnervingly calm” – maybe the hat works! I saw him going into Pret Leicester Square just yesterday, but once before in Cineworld Trocadero watching X-Men First Class. I have a feeling he’s a bit of a comic book geek! i saw him in Forbidden planet too. Browsing the star wars merchandise. Haha he walked past me and my boyfriend in the promethus section of forbidden planet, so funny! I just googled what it meant and he actually popped up amazing!!! My friend and I saw him on a train from Watford to Euston on Monday. Loved everyone sitting on a train politely ignoring his rather bonkers headgear. He had a forbidden planet bag with him. …. I have the same pic I took tinight on my FB page. I just wanted to say you have made my year, I see Dominic on a semi-regular basis and often in a very dazed state, either on the way to or on the way home from work. I was genuinely starting to question my sanity when I couldn’t find anything on the internet about ‘pyramid hats’, but then I stumbled across this little gem and all is good. He is in the MetLine to Baker St as we speak, in front of me. Had to google it and came up with this site! I don’t think the triangle calms him that much. Tonight I saw him in Pinner, at Pizza Express. I was very intrigued by his triangle and did a quick google search and has brought me to this sight also. He was with a friend and looked very calm and dazed. My unanswered question however remains – what convinced him to start wearing it in the first place and why does it have to be 24/7? I see him occasionally when getting off the tube in Pinner. Only lived in London 4 months but its not the oddest fashion Ive seen here. To be honest I’d assumed it was religious, and he was a priest for some kind of small following. Spotted him, or someone else with a Raydome, on the Metline, he got on at Northwick Park. Don’t know where he got off, just noted the many puzzled faces as he wandered up the carriage. Spotted last night (160113) also in a Pret a Manger near Covent Garden… As usual scribbling in a notebook.. Curiouser and curiouser! We have just located this human on the Bakerloo line platform at Piccadilly Circus around 6pm on 27 January 2013 after his headgear interfered with our signalling and caused our spaceship to crash in Russia recently. We shall shortly be removing him from earth for further examination. I spotted him last night at The British Museum Members Night in Room 2 looking at the Sutton Hoo Mask. He was wearing the Pyramid and the same jacket but had 2 friends – man and woman both about 30 normal looking. No other headgear spotted on them. I spotted the headgear today at Pret near Leicester Sq. – I was fascinated to see this again having first spotted the gentleman at Tata Modern a few years ago – delighted to find this blog site. Next big question – what’s the significance of his necklace/chain? Saw this guy for the first time today in Pret, Leicester Sq / Long Acre. This seems to be his preferred ‘hang out’ going by the responses above. I talked to him by the counter and eccentric is certainly one way of describing him, but nonetheless seems like a harmless guy who just likes walking round with a metal pyramid on his head. He is sitting behind me in the British Library. I just had to break the monotony of study to Google “man with pyramid hat”. Inquisitive mind placated. yep, same here, he was at the british library in humanities 1 today! Spotted in Pinner Pizza Express with friend and Dalek model. Some years back also saw him and friend examining moon pictures in great detail. I saw him today… same clothes etc. It’s the second time I’ve seen him in the last 6 months in Leicester Square. Does anyone know what the crystal/pendant round his neck is for? Saw him yesterday in the Cambridge Circus Fopp, looking at the Anime DVDs. I thought I was hallucinating. Took a few shots with the stealthy Ricoh GR. I saw a guy wearing one of these on Glastonbury High Street yesterday. It’s obviously catching on. If he (Dominic) or anyoneelse is wearing a pyramid shaped headgear, and you simply do not understand why; you can laugh/be amused good for you.But certainly you do want to know the reason why this is catching up, doyou ? I am sure you do. So let me put some interesting scientific facts about pyramids. B) Just dont be bothered if some of it does not resonate with you, pick that which does make sense and ignore the rest! Be blessed! Similarly, if one is trying to meditate under a Pyramid, the person’s efforts are amplified and he is able to reach the ‘thought free’ state faster under it. First sighting of 2014 – I’m so proud. The pyramid-head-geared man crossed the road in front of me near Long Acre, he gave me a sort of knowing smile. I’ve now seen a man wearing a pyramid on his head – tick. I sat next to Dominic on a seat at Baker Street this evening whillst waiting for a Metropolitan Line train. At first I thought it may have been a medical fixture with wires inserted into his skull ….durrrrrrr said my friend, he’s just a nutter. My reply …well he’s a very well-dressed nutter and looks completely sane, apart from the contraption on his head. Next thought …….. a religious headpiece …..durrrrrrrr said my friend again! And so now I have an answer ….thank-you Google! i don’t know why it occured for me to search this but i remember seeing this guy years ago in Borders. I asked him about that hat and he seemed like a cool dude. Bit odd. But cool. He is in Ñero Pinner. RIGHT NOW !!!! Just saw him on the Bakerloo line travelling north towards harrow & Wealdstone. Wish we’d had the nerve to ask him. Saw him in the curzon soho, upstairs cafe for the first time in years. Used to see him very regularly in HMV trocadero, always in the same sections as me, horror/sci-fi and anime. I was pretty happy to see he was still about. Cool looking guy. I wish I had spoken to him. He was just opposite me on the Watford train from Baker Street. Got off the train at Pinner. 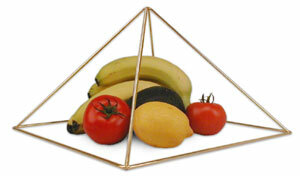 May have to get me one of these pyramid things, they’re rather fetching. I want to meet someone who has a rhomboid on his head. And have a face off! Saw the triangle hat man in Piccadilly Circus area….walking towards Trocadero/Leicester Sq direction. 13 April 2014 around 4:30pm. Oops, correction 13th MAY 2014!!! I first saw Dominic in January 2014 at Pret a Manger and it was quite a shock to the system at first site. My boyfriend, his nephew and I were genuinely intrigued by his pyramid ( as was the rest of the customers) but no one us dared to speak to him. We even took a sneaky picture of him. Then to our amazement (my boyf. and self) we saw him this Saturday (July 2014) in Forbidden Planet. We were walking out as he was walking in, but I’m glad to report this time I sung round and followed him downstairs to the comic section (Alan Moore) and asked his why he wore that interesting pyramid. I was quite cautious as I didn’t know if he was mad and disturbed, but in fact he was actually very gentle and sweet. He had a surprisingly soft calm voice and he sounded rational. He said he wore it because it lowered his anxiety; reduced pollution and kept him calm. He also told me that it was an American product, made out of steel and he’d been wearing it for 8 years. I saw Dominic on the Northern Line this evening (25-7-14). I changed from the Central Line at Tottenham Court Road and boarded his carriage. He was also sporting a large medallion on a chain. I’ve just seen him on Foyles sci-fi department, same clothes as in the pics. Googled and found this blog, amazing guy, I would love to seen his hat become a trend. Saw this guy in Leicester Square on Fri 19 Sept, just Google and happy to know not seeing things lol. Just seen him today on the escalators to the southbound Bakerloo and jubilee lines at Baker Street. I saw him earlier today heading into Totenham Court Road tube station. Feels wrong documenting it here, but it feels more wrong not to. I saw him in Forbidden Planet on Saturday. Googling him brought me here. I just saw pyramid man on the Metropolitan line from Amersham to Aldgate at 5.40pm when I gotten on at North wood and used this blog to find out while standing next to him. A great British eccentric indeed! Sat next to him on the tube this morning – Metropolitan Line to Aldgate circa 8am – had no idea what the pyramid was for and googled “gold pyramid on head” just now, which brought me here. Thanks for making this post. What a delightful story (and even nicer to see all the people who’ve spotted him and come here to say so!). I saw this man yesterday in the London Underground !!! Thought it was so bizzare what he had on his head so I googled it and this came up !! Just saw him on Shaftesbury Avenue…. I have conquered my Parkinson – Alzheimer disease and enjoy exclusive happiness with every breath. An alloy of gold and silver is called ELECTRUM, not orgone. Well thank you, I wondered if it was a religious icon. He wears an interesting pendant with a conically raised sphere on a circular base. See him most days on the way home from work. I’ll say hello. sat next to him in the hair dressers today. He wasn’t wearing it though which was probably quite sensible. There’s only one outcome if you had a hair cut wearing a pyramid. Wasn’t sure about this. It now having scrolled through all the messages, it seems that I saw Dominic on the the train today, the central line going east.I’m so intrigued!! Spotted in Nespresso Regent Street store at approximately 17:45 sporting Pyramid and same clothes as previously mentioned. Now we know he likes his coffee! I find it really heartwarming how many people notice a person when in London alone it’s very easy to feel invisible. This is lovely. Also, Dominic seems to be living the life I wish I was living…maybe I need the pyramid. I often see Dominic on the tube at Pinner Station. I thought his wacky head job was a Scientology Gismo. I now think that we are all thinking there is something wrong with him and he knows there is something wrong with us. Saw pyramid hat man on the Piccadilly line tonight – same brown jacket he’s wearing in most of his photos. Googled why that was and here I am! I saw him today at the Tate Modern at the Pierre Bonnard exhibition!! We were really amused by his pyramid and now we found this page…. Since 2006…. Incredible! !